A wedding is an important event; this is an irrefutable fact. Owing to the importance of a wedding as a social event; people do put in a whole lot of effort into ensuring that it is a day to remember. Making a wedding a memorable one in this day and age of Twitter photos and Instagram; goes beyond the perfect venue, great food and the participation of friends and family. It is about planning and executing a day unlike any other day and this is where theme weddings come in. Adding a theme to any wedding is a conscious effort to tell a fairy tale story set in different setting and Indian theme weddings definitely do stand apart from the rest; owing to the vibrant display of colors, music, and dancing. The theme of an Indian wedding is a common thread that runs through all the big and small events that take place within a wedding and the theme often determines the décor, food, and fashion at a wedding. The list is endless when one tries to delve into the many Indian wedding themes that have been explored but with this blog; we bring to you 5 of the best Indian wedding themes. Read further for fun ideas and suggestions on how to implement these themes for your very own wedding. Listed below are our top 5 picks for wedding themes. These themes make the cut purely because of the fact that they compliment Indian wedding traditions and rituals. Read further to know more. Flowers are a staple at any wedding and a wedding isn’t really aesthetically complete without floral decorations. If you don’t really have a theme in mind for your wedding; you might want to build your wedding theme around the usual floral decorations that are often taken for granted. This Hanging Gardens theme in the picture above is an excellent example of the point being made. Recreating this theme does not require much effort and your décor budget is only slightly increased even as you substantially increase your floral décor budget. 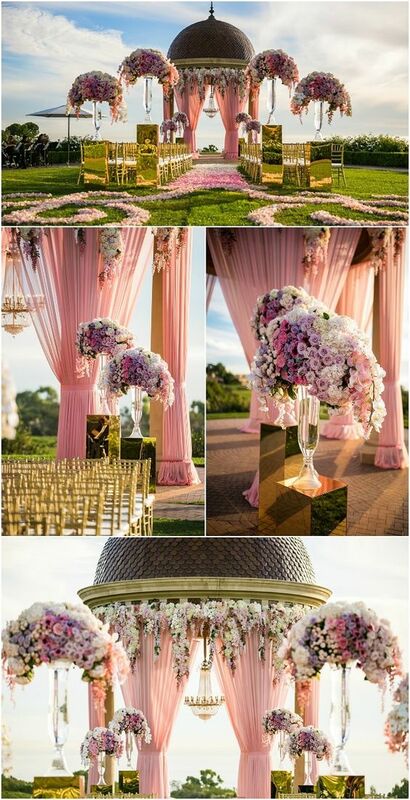 The emphasis of this theme is building a floral fantasy land of sorts where a princess and a prince; read bride and groom; unite together for a lifelong partnership. It is worth mentioning that this idea needn’t be replicated just the way it is; it can also serve to provide inspiration for your very own floral-themed wedding. As is evident; this idea is best executed outdoors and makes for a great spring wedding theme. Gold is a big part of the Indian wedding and is often considered an auspicious and valuable metal. These facts provide much impetus to make gold the theme at your wedding. While it is easy to make sure that there is plenty of gold in your bridal fashion; gold décor will add even more glamour and glitz to your wedding proceedings. Too much gold in terms of wedding décor can be overwhelming for the senses so it should be offset with other contrasting colors like black, white and red. 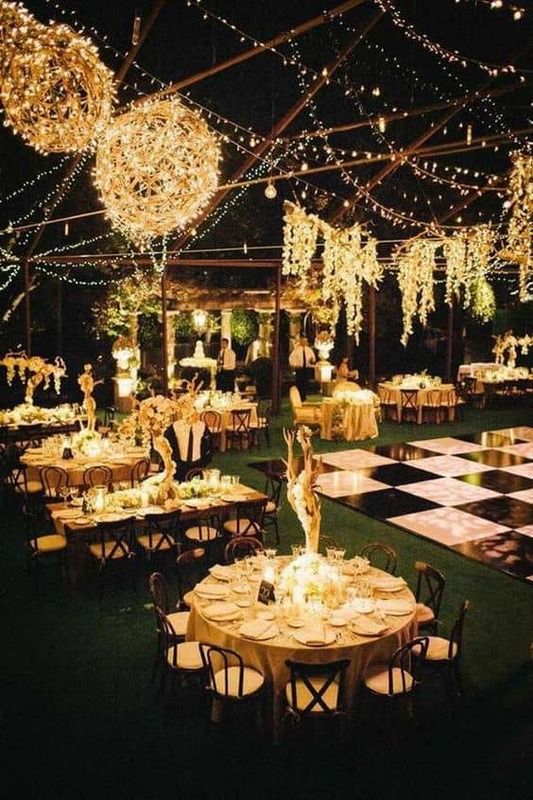 It is quite easy to see how gold can dominate your wedding décor, however, the picture above is an excellent example of a Classic Gold Theme Wedding. Red is the color of love and passion and in India, it is an auspicious color most often associated with weddings and wedding paraphernalia. From the color of Vermillion that goes on the bride’s forehead to the resplendent red bridal lehenga or saree; red often dominates at Indian weddings. Bearing all of this in mind; making resplendent red the theme of your wedding is an undeniably great idea. 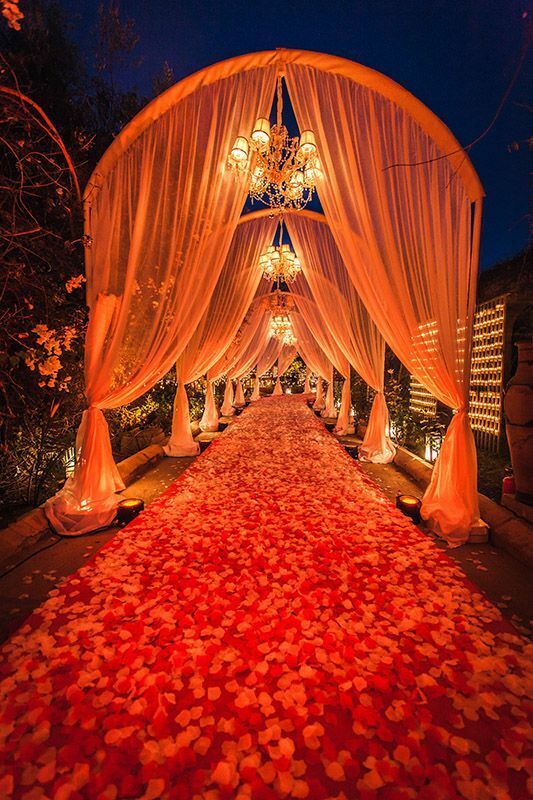 The picture above is a brilliant example of how the color red can be used to decorate your wedding venue. Just like gold, too much red can be overwhelming; which is why the color needs to vary in terms of different shades of red and pink. Red and pink roses, red drapery and contrasting colors like white and gold can combine to form the perfect Resplendent Red theme wedding. There is no doubt that this is a wedding theme that won’t be easily forgotten. 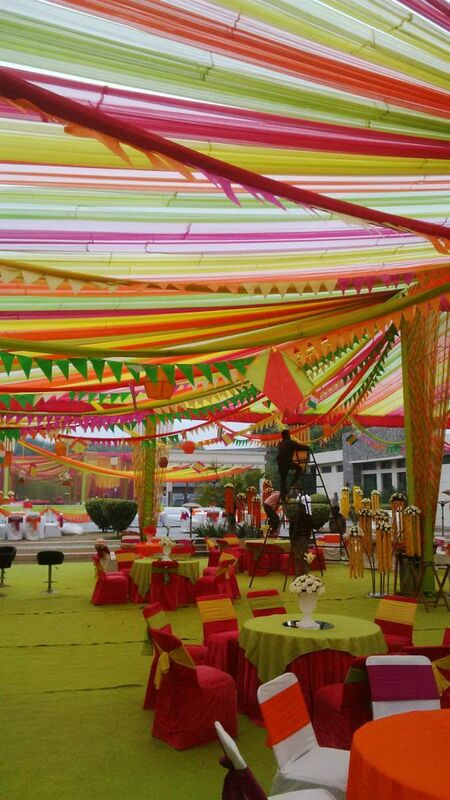 Everybody enjoys a good mela and everyone will enjoy a mela themed wedding. The peacock is not only India’s national bird but is also considered one of the most beautiful birds all around the world. The vibrant display of colors a peacock’s plumage has to offer has long inspired art and décor. The beauty of this bird and its relevance to Indian culture makes it a great inspiration for wedding themes. 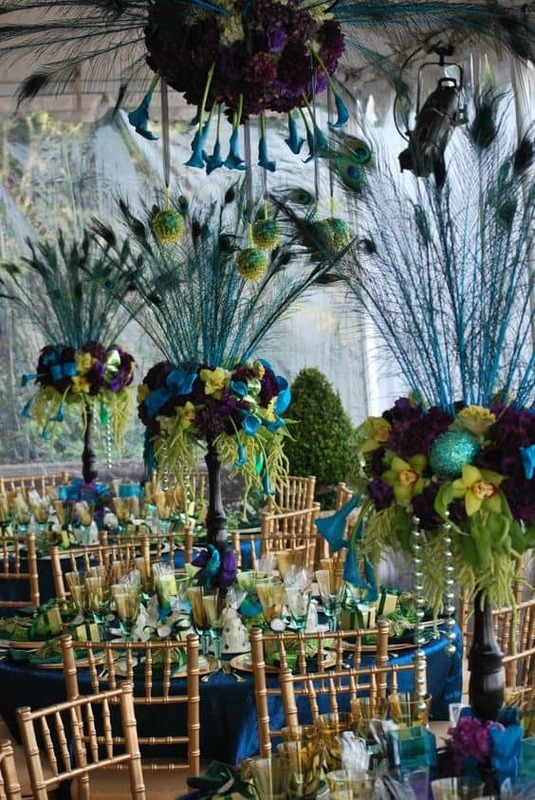 For a peacock themed wedding; you can choose to be inspired by the colors of the peacock or you can use replicas of peacock plumage to decorate your wedding venue including the reception space. The picture above provides plenty of inspiration for an awe-inspiring peacock themed wedding. In conclusion; wedding theme inspiration can come from anywhere however listed above are popular concepts for Indian wedding themes that complement our culture and traditions. These concepts can be replicated as they are or one can draw inspiration from these concepts to come up with a totally new theme. One way or the other, themes make your wedding beautiful and memorable.